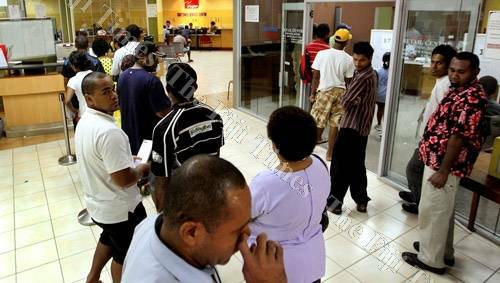 UNCERTAIN TIMES: Patrons line up outside the FNPF Customer Services Care centre in Suva. pic Eliki Nukutabu via Fiji Times. OVERHAULERS: Khaiyum and Ajith Kodagoda. The illegal atorney general, Aiyaz Sayed-Khaiyum, continues to try to justify the regime's plans to overaul the Fiji National Provident Fund saying some terrible decisions were made by FNPF between the 1980s and early 2000. Sayed-Khaiyum has told a meeting of Australian and Fijian accountants that people should realize the earlier Fund decisions were made by government, employer and employee representatives. In yet another effort to justify the radical changes which include cutting pensions from 15 to 9 per cent, Khaiyum is quoted by Fiji Village as saying it is now imperative the people with the right knowledge and skills are appointed to key positions. The FICTU march against the proposed FNPF changes planned for today, has meanwhile not taken place because the Commissioner Central refused to grant the permit. Security reasons have been cited. FICTU had planned to rally in Suva as a follow-up to its submission after the FNPF board failed to respond to calls to meet and discuss the controversial reforms. The union represents more than 350,000 FNPF members and about 11,000 pensioners. In a statement, FICTU's general secretary, Attar Singh, says members are "obviously very disappointed by the decision of the authorities to deny us the fundamental right to expression by refusing us permission for our planned demonstration." "The Protest March and Rally were intended to highlight our concerns and opposition to the FNPF reforms through the most peaceful means available to us. We cannot comprehend how a march by only a thousand people could be considered a security threat to anyone. "The authorities need to understand that by denying us the right to demonstrate they are in fact aiding the FNPF in its planned reforms which we have already shown are without basis and against the interest of all FNPF members and pensioners. "It should also be understood that we represent legally registered trade unions which have the right to collective bargaining and the right to freely organise their activities in the interest of members and workers generally." Singh says the refusal of the permit is a violation of workers' rights as contained in ILO conventions 87 and 98 which have been ratified by Fiji and the FICTU board will look at filing a complaint to the ILO. 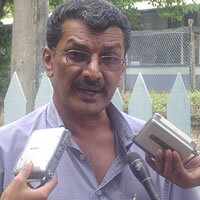 He says FICTU will also organise a petition against the planned FNPF overhaul next week. "Meanwhile we repeat our call on FNPF to suspend its planned reforms and maintain status quo until after the 2014 elections and to review the matter thereafter. The FNPF is sustainable for the next 30 years. Elections will be held in two years. So why the rush?" The army appointed AG should tell the members of FNPF such as myself, which board members and advisers they appointed to FNPF when they seized power in December 2006, what these people were paid and what if anything they contributed to FNPF. All wrongdoers should be brought to account, this has nothing to do with politics but the livelihod of our older citizens. Haven't Fijians got it yet ? Aiyaz is after your land, it begins by destroying your Indigenous Institutions, breaking your will to resist and decimating your Economy to the point where you all have no choice but to acquiesce to Frank and Aiyaz whims ! A reduction in Pensioner Benefits assures Frank and Aiyaz, that they will have a supply line to the Fiji workers coffers ! They are like bloodsuckers, living off others hard earned cash. Nothing but a bullet to the forehead will stop them. Vinaka baraca Attar. Fire tiko. We need true and honest leaders like you. I just wish there were other leaders supporting you. But in the end you will win. And that day is dawning. Amen! FNPF/ATH CHAIRMAN IS SRI LANKAN.AJIT.K. HE IS C J PATEL FC. CONFLICT OF INTEREST .THEY OWN INK MOBILE AND SELL VODAFONE RECHARGE. THAT MONEY BELONG TO MEMBERS NOT GUJIS/BAI/ASK. SHOOT TO KILL THE ONLY ANSWER FRANK AND A--ASSS HAVE TO GO BY A BULLET EACH. ONLY WAY TO SAVE THE COUNTRY. Wea is Roko ului. No show or what. What happended to all his meetings. Typcial chief, all talk. 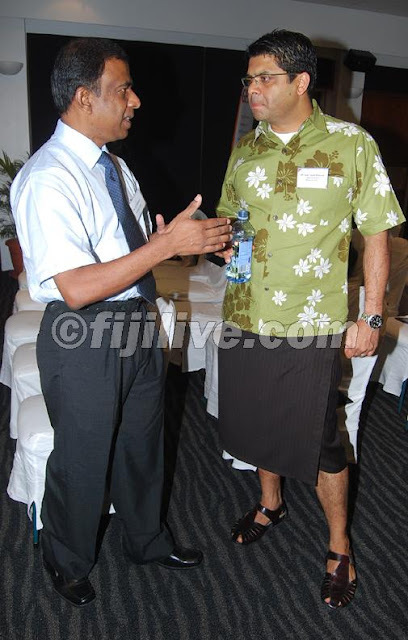 This has gone too far for the two top Govt men to all FNPF members. What about explaining the lost and investigate responsible pers and Companies linked within this two years and put them to jail while we wait for election in 2014 and make decisions after election? Note: 1.5 billion needs proper explanation. This is the reason for the extra time before the election. If, if this is not done, well you are digging your own grave. Beware and take note! Frankly I fully agree with "Convoluted Experiment" and "Naliva's Twin Brother" - only a bullet each in the head of Josaia Cranky Voreqe Bainimarama and Aiyaz Big Arse Sayed Khaiyum will put an end to all these challenges Fiji is, especially the I Taukei are faced with. This is the challenge given to those soldiers with guns at the QEB, are u all gutless? My guess is comments in this blog are from people who have nothing to loose. And with recommendation for violence will have also nothing to gain. What makes him an expert at FNPF? He doesn't know the head from the tail. Just stuffing everyhing up. May the God Jesus Christ that I serve protect you and bless you with the work you are doing for all of us and our country. Amen.